The Fiona Stanley Hospital maternity service is provided by midwives, doctors, nurses and allied health professionals with the support of neonatology and all related specialties. We focus on providing a woman-centred model of care. Our service provides care for low risk women, through to care for women with complex medical and obstetric problems. Care is provided through our outpatient medical and midwifery antenatal clinics, as well as inpatient wards, the birth suite and the Maternal Fetal Assessment Unit (MFAU). FSH provides care to all women who live in our postcode catchment area. Find out by using your postcode (Healthy WA) if you can be referred to our maternity service at Fiona Stanley Hospital. To receive maternity care at FSH you will need to be referred by your General Practitioner (GP). FSH has a commitment to providing GP shared care. Please discuss this with your doctor to find out if you are suitable for this type of care. We also offer specialist consultation and referral to all women in the south metropolitan area with medical conditions including increased BMI and diabetes in pregnancy requiring Insulin management. Complex fetal medicine services, including births under 30 weeks, are not provided at our hospital and will be transferred to King Edward Memorial Hospital. Although you may have been referred to FSH and have attended antenatal clinics at FSH, you may not necessarily deliver at our hospital. This will be determined by the demand on our maternity unit on any given day. In the event that you cannot be accepted by our maternity unit, you may be directed to another maternity hospital. Midwifery led clinics for low risk women. Consultant led antenatal clinic for medium/high risk women including specialist clinics for the various complications in pregnancy. 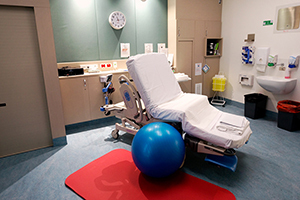 Maternal Fetal Assessment Unit (MFAU) - access via the birthing suite on level 3. A visiting midwifery service to allow mothers and their babies to return to their home environments as soon as they are able and be seen by expert midwives. This service is available throughout the week. Parent education classes during pregnancy. Newborn hearing screening is available seven days a week. If you go home early you are able to come to clinic to ensure this screening test is completed. Fiona Stanley Hospital is committed to ensuring low risk women can continue to access their General Practitioners for the majority of their antenatal care. Fiona Stanley Hospital, as Level 5 Obstetric hospital for the South Metropolitan Health Service (SMHS), provides a consultancy and referral service for the management of high risk patients. 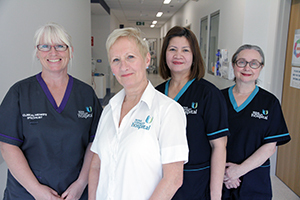 The referral pathway to Fiona Stanley Hospital for management of women with Body Mass Index (BMI )>40 in pregnancy has been structured to offer the expert care that is required, while maintaining patient-centred care and allowing women to care close to home. Referral pathway for gestational diabetics requiring insulin review at FSH (effective 16 February, 2015). It is essential that the correct information is provided by the referring site to ensure appropriate review. This includes NWHPR up to date referral, booking pathology, medical imaging reports, medical and obstetric history. Completion of the form, including the blood glucose table on the referral letter, will enable the DIP team to prioritise any women requiring urgent medical review. However, it is the responsibility of the referring site to contact FSH Maternal and Fetal Assessment Unit (MFAU) urgently on 6152 4301 should they have significant concerns for the wellbeing of the woman. Fiona Stanley Hospital provides a consultancy and referral service for the management of high risk patients with underlying complex medical conditions. The referral pathway to FSH for management of women during pregnancy is via the FSH GP referral form. The referrer should contact FSH Maternal and Fetal Assessment Unit (MFAU) urgently on 6152 4301 if they have significant concerns for the wellbeing of the woman. The inpatient service is located on level 3 of the main hospital. a co-located obstetric theatre for emergency caesarean sections and procedures. See the maternity service photo gallery. Our Maternity service is located in the main hospital building.